The quality of the Sakura Diamond is guaranteed; we only select high-quality diamonds which are endorsed with the grading report. The grading of diamonds is represented in 4 Cs; carat, cut, color and clarity. Sakura Diamond only uses VS or higher classes of clarity, as it determines the quality of the diamond. The cut of Sakura Diamond is decagon-shaped and eighty-seven facet, not like a regular fifty-eight facet, round brilliant cut diamond. Sakura diamond requires tremendous efforts as well as considerable skills. In addition, accurate symmetry is required to express the 5 petals of the cherry blossoms elegantly. When a regular round brilliant cut diamond is cut into fifty-eight facet, the Sakura Diamond is cut into eighty-seven facet. As the number of the facet is one and a half times as many (29 facet more) as a traditional cut, the Sakura Diamond successfully creates more sparkles. 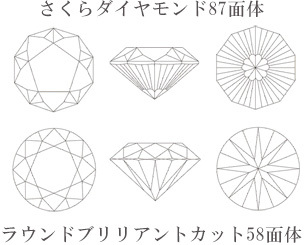 The decagon-shaped and eighty-seven facet cut technique for Sakura Diamond is the original registered design in EU, the US, South Korea and Japan. Sakura Diamonds are high class diamonds and all attached with grading reports. In addition, guarantee card that certifies Sakura Diamond also accompanies with each product. *Note: this photo is taken with a pink filter on to produce the image of cherry blossoms effectively. Sakuara Diamond jewelry is beautifully packaged in our original case. The special loupe is also included for you to enjoy cherry blossoms on the diamond. The engagement ring will be contained in the original box made of paulownia wood and tied with red-and-white paper string for celebration.